Superman – one of the oldest comic book characters, who, perhaps, has had greatly influenced the culture of the United States of America. In his movie “Man of Steel” director Zack Snyder breaks all the stereotypes about this “DC Comics” fictitious character and makes people realise that Superman can be very humane and vulnerable likewise. It should be also noted, that a significant contribution to this movie was given by “The Dark Knight” creator Christopher Nolan. During the collapse of the planet Krypton a newborn Kal-El is sent to Earth – this act provokes General Zod, who swears to find and kill Kal-El. Kal-El is named as Clark Kent on Earth. He has to adapt both to the new environment of the planet and its people. Though in previous movies the superhero fought against people, in this movie the battle gets even more challenging. Here Kal-El fights against General Zod – he is also from the planet Krypton and has the same supernatural powers as Superman: laser gaze, ability to fly and a titanic strength. “Man of Steel” finally reveals how Superman was raised and what problems he had to face. Sensitive topics such as sneering and intolerance are touched. It is worth noting that the topic – lack of tolerance for different people was also presented in other movie about superheroes “X-men”. Christopher Nolan’s distinctiveness is the creation of quite realistic characters and because of this supernatural Superman is portrayed more humane and not afraid of showing his emotions. As a child Superman was not happy about his superhuman powers which made him feel as an outcast. He was not understood by his parents either as they forbade him to use his superhuman powers. However, they did so fearing that Clark Kent might stand out of the rest. Even though he could have saved his father, the superhero did not use his powers during the moment when his father was dying. Movie “Man of Steel” highlights father’s wisdom – it guides Superman throughout the movie. Because of this the movie resembles “Superman Returns”. However in this movie it can be clearly seen who gives all these advices, although in both cases the father is just a memory in Superman’s heart. Superman’s costume has changed – it became darker and it is not playful or childish anymore. Movie director decided to unveil the meaning of “S” sign which resembles to letter “S”. This sign symbolizes a hope that there is good in every person. To biggest disappointment though is that Superman’s character that was so different from the previous ones throughout the whole movie ends being exactly the same. He unfolds as a typical “DC Comics” creation. Director left no space for romance in this movie. Moreover, the movie is rather tense, thus, there were no space left for humour as well. However, this movie is way better than movie “Superman Returns” (2006), which suffered a complete fiasco. A lot was expected from this movie; nevertheless it disappointed the audience by a typical romantic-movie cliché plot. When “Man of Steel” creative team was joined by “The Dark Knight” director Christopher Nolan, movie fans debated whether Superman is going to fight against Lex Luthor in the same way as Batman fought against Joker or another villain character will be introduced. It was also feared whether Superman was not about to become too realistic. In “Man of Steel” one may feel director’s Christopher Nolan’s influence even from the first minutes of the movie trailer, which by its sulkiness reminds The Batman trilogy. However, director does not want Batman to be comparable to Superman. A fight of two aliens excites a viewer and promises a huge dose of special effects. Agreeably, Marvel Movie Company once again highlights itself as one of the best creators of special effects. Brilliant director’s idea was “shaky camera” effect which gives a feeling of being in the middle of the action. In addition, 3D visualization contributes to spectators “real” involvement within the action scenes. Viewers are sucked into action from the first minutes and yet subsequently prolonged fights get slightly boring. For the first time Superman appeared in “Action Comics” magazine’s June issue in 1938. On the front cover Superman was presented holding a car. June 2013 issue of popular comic magazine “Entertainment Weekly” was illustrated by Henri Cavill – the hero of the newest movie “Man of Steel”. Even before the movie hit the movie theatres it had already became very profitable. Movie makers have already retrieved three quarters of expenditures just by granting certain music bands for movie promotion. For this reason, “Man of Steel” is probably the most promoted movie throughout the entire cinema history. Furthermore, it is believed that this movie will be the most profitable movie of June. 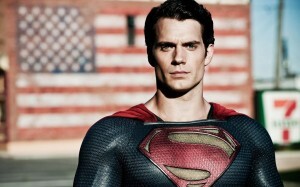 “Man of Steel” surprised everyone when the main role was given to not so well known actor Henry Cavill. However, there is no need to talk about the professionalism of actors such as Micheal Shannon who created General Zod role, or Russel Crowe who embodied Superman’s biological father. In “Man of Steel” these actors once again showed their incredible talent. Superman father’s role was entrusted to Kevin Costner, who was a pleasant surprise, since he has just came back to cinema screens after a break. Amy Adams created Lois Lein character; she had a slightly different role in this movie, where she had not to lose her mind for Superman. Lois Lein was supposed to be more a counterpart in this movie; she even was rescuing Superman in one of the movie scenes. “Man of Steel” is a long-awaited continuation of Superman series. Movie creators surprised the audience by gathering great cast of actors. Furthermore, the movie captivated by trying to solve psychological Clark Kent problems. As a result, not only action or fiction lovers are going to be interested in this movie. In addition, it is meritorious that Superman is portrayed as a mature man. His behaviour, appearance and clothing unveils that he is not a child anymore. For all these reasons “Man of Steel” may be called as one of the best Superman movies. Although, notwithstanding the fact that special effects really impressed, it is worth noting that the script was kind of tame and some movie parts were too long. However, the movie culmination is optimistic, as Superman does not disappear, but continues helping people protecting them from aliens and themselves.